Big Fish! Big Fun! Big Memories! Pensacola Fishing offers inshore, nearshore, offshore, and deep sea fishing trips out of Pensacola and Pensacola Beach. With an extensive fleet of boat we can help you decide what will be the perfect trip for your family, friends, or group who will be joining you on your fishing adventure. Experience and days on the water is everything in the fishing charter industry and with Pensacola Fishing you get just that without a doubt. Inshore and nearshore charters are operated on twenty-two to twenty-four foot bay boats, while offshore and deep sea fishing charters will be on thirty-one to thirty-four foot center console offshore boats. There’s a long list of species we catch including red snapper, gag grouper, triggerfish, amberjack, vermillion snapper, king mackerel, Spanish mackerel, speckled trout, redfish, flounder, sheepshead, and of course SHARKS. Inshore fishing charters out of Pensacola are a cross between inshore and nearshore just depending on the weather conditions, what’s biting, and what you would like to catch. These trips are priced for up to 4 anglers, but can take up to 6 people. True inshore species like speckled trout, flounder, redfish, and sheepshead are caught in Pensacola Bay, Santa Rosa Sound, and Big Lagoon. This type of fishing is great for small kids or anglers who are prone to getting sea sick. 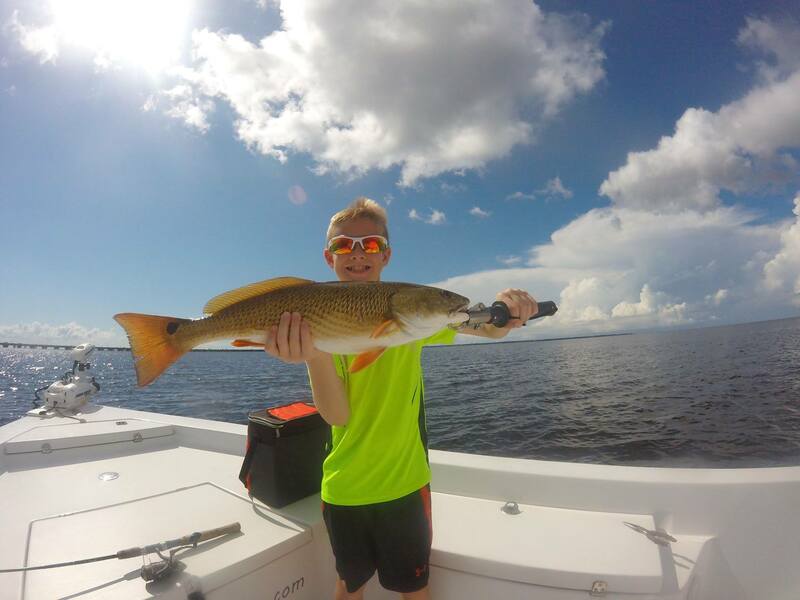 Nearshore fishing is also an option when the weather allows, on these trips you’ll venture out into the Gulf of Mexico for species like red snapper, triggerfish, amberjack, and grouper. Fishing regulations also dictate the type of fishing and target species if you’re looking to take fish home for dinner. Many of our popular species have short seasons, but catch and release is always an option, a photo with a trophy fish lasts a life time. 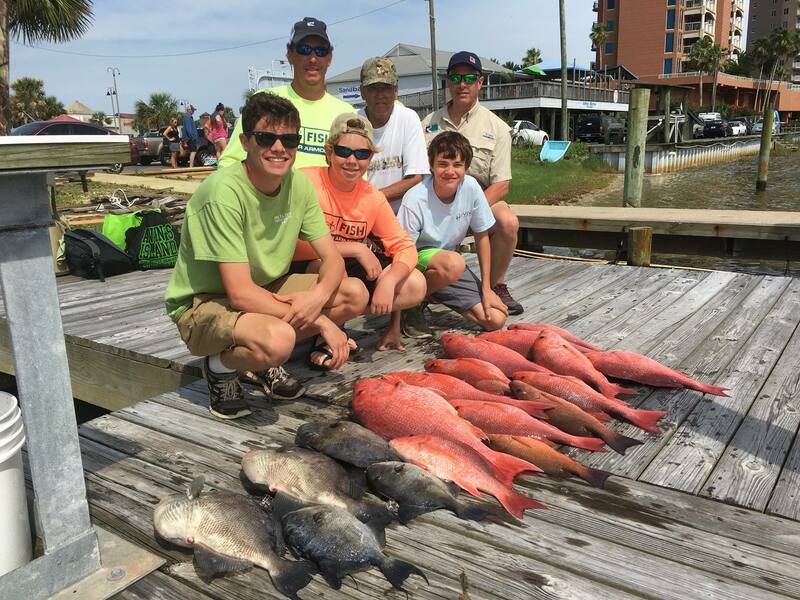 Offshore fishing charters (deep sea fishing) out of Pensacola and Pensacola Beach venture out into the Gulf of Mexico for a variety of species including red snapper, gag grouper, triggerfish, amberjack, vermillion snapper, scamp, sharks, mackerel, and much more. Our popular bottom species; red snapper, triggerfish, amberjack, and gag grouper are highly regulated and have short season. The seasons are not consistent from one year to the next, so if there’s a certain species you’re trying to check off your bucket list give us a call. The majority of the fishing on our offshore fishing charters is bottom fishing, that’s what our area is known for world wide. On these adventures everyone on the boat gets a rod and reel and gets to be part of the fun. If you’re more into trolling for big game species like tuna, wahoo, dolphin, and billfish that’s also an option, but please understand you’ll need a longer trip because it’s about a thirty to fifty mile trip just to get to the grounds to target them.